This coupon was last used 5h ago and is currently rated Not Likely to work. Expired 1mo ago . Last validated 2mo ago . Used 66 times. daniel oliveros This is an amazing deal. Simply enter the promo code during the checkout process to apply the discount. Some exclusions may apply. John Moreno This promo code works as described. 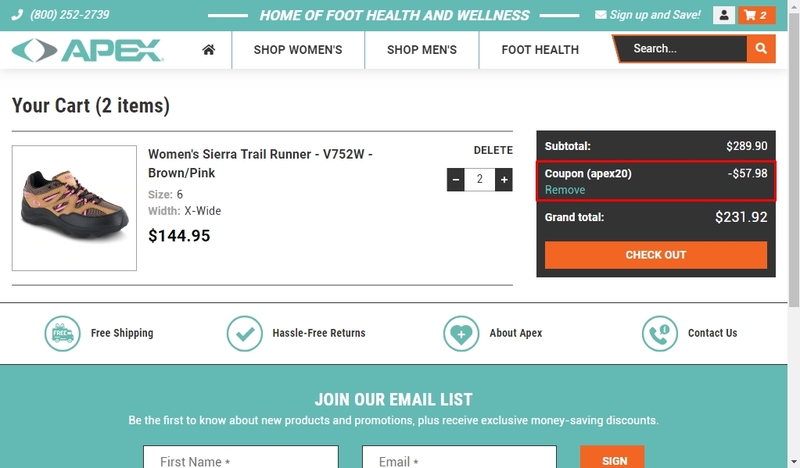 Just go to the online store, pick your items and add to your cart, apply the promo code (APEX20) during the shopping cart process and get 20% off your next order at Apex Foot Health. For more information about this deal see screenshot. German This deal was verified and it is working as described. Select the items and enter the promo code <APEX20> at checkout to get 20% off your next order at Apex Foot Health.